SUSAN ELIA MACNEAL: Today, something a bit lighter. John Oliver, the host of HBO's Last Week Tonight with John Oliver, is a ninja of decency and common sense. Recently, Oliver admitted he was frustrated by the fact that cameras aren't allowed in the Supreme Court and "so most coverage of our most important cases looks like garbage." And so he decided to do something about it. "We fixed that problem with real animals and fake paws. Feel free to take our footage and reenact cases on your own." For a video of John Oliver on the Supreme Court, click here. For a video of the #PuppyJustice raw footage to be used for Supreme Court reenactments, click here. For a video of the #PuppyJustice footage used to illustrate the Aereo case, click here. For a video of #PuppyJustice used for the film A Few Good Men, click here. SUSAN ELIA MACNEAL: Reds and lovely readers, what do you think about the no filming rile of the Supreme Court. What do you think about #RealAnimalsFakePaws? 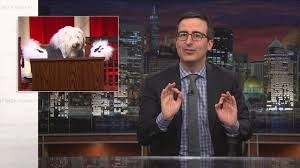 HBO and John Oliver have allowed and even encouraged free use of the footage for educational and entertainment purposes. What Supreme Court case would you most like to see it used for? Bonus question — who's your favorite doggy Justice? These were so funny . . . I hadn't seen these before so thanks for the links. 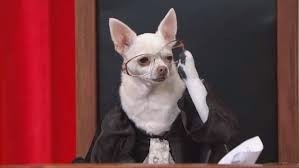 I loved all the dogs, but Justice Thomas was my favorite. I have no idea why the workings of the Supreme Court should be so shrouded in secrecy. Cameras sound like a perfectly good idea to me. Or, if no cameras, then those courtroom artists who draw the pictures and the news folks who report about the case. Susan, I watched this video last week and just screamed with laughter. What fun that your hub did some of the paws! 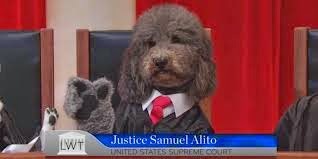 Since I tend to like most dogs more than I like most people, I'd be all in favor of a Supreme Court actually made up of canines. Thanks for the links. But cameras in courtrooms have been only slowly allowed, state by state and court by court. I think the idea behind not having cameras in various courts was to prevent trials and hearings from turning into circuses (but of course, to really enforce that, you'd have to make sure there were no clowns on the bench). I think the general public doesn't "get" what goes on in appellate courts, especially given the ads I see for those running for the WI Supreme Court of late: "Judge X X is tough on criminals" News flash: criminals almost never come before an appellate court; when they do (not in person but via their lawyers) it is on some technical point such as, was the wrong jury instruction given by the trial judge despite the timely objection of defense counsel? Ellen, I've often thought I don't have the composure to argue before any court of any kind. It does take a certain type of person to do that unemotionally, and with laser focus on both the effects of their words and actions and the outcome they want from them. Also, in the mid-70's I briefly dated a lawyer who was running for judge for the first time. He told me how horrible it was that judges, who are supposed to be impartial, have to declare some kind of political leaning to get elected. He's still on the bench here in Cincinnati; in fact, I've seen him a lot on TV just recently, since he was overseeing a controversial case against another judge. Susan, so cool to get a peek into the inner workings, not of a courtroom, but of John Oliver's production. How fun for Noel to be part of it. But also, I don't see the Supreme Court as shrouded in secrecy. The rulings of the court are made public--the full text of all opinions rendered. Just because we have the technology to bring every aspect of every human act into our lives, I don't think we need to do so. And love the dogs & paws!! This is hysterical - thanks for the levity this morning as I'm still reeling from the election returns. I love that your delightful hubs was a part of this. How very cool! oh, SO funny! You all are so incredibly talented..
Jonathan has argued in the Supreme COurt--wonder what he'd say? I saw the video, it was hysterical. I'm not sure the American public has the attention span, or knowledge, needed to fully understand court proceedings. I think our tendency to listen in "sound bits" could be disastrous. I think that at the trial court level where much grandstanding goes on already and is open to the public, cameras can induce circus behavior at a new level. Especially people seeking to further their public office careers. At the same time, once they were installed and became a normal part of the the court, people would forget about them. Think about all the places you are filmed that you have forgotten about. As for a place like SCOTUS, they already record the audio, so no biggie for the video. What would reduce the possibility of a circus like atmosphere would be to record it via camera and only release the arguments, unedited, AFTER the decision has been issued. In this way, the arguments are available to the public and law schools for educational purposes, and yet the grandstanding would be meaningless because the incentive to play to a crowd that won't see it UNTIL AFTER the decision renders those behaviors futile. Thanks for the kind words, everyone! Glad to bring some laughter to the end of your week! What a crack-up, Susan! Thanks for sharing this. I think the Supreme Court proceedings are better left without media. Media just mucks things up, and having their every comment judged by the press could taint their decision-making. We don't need further sensationalization (is that a word?). Naturally, Noel is my favorite! I'd rather see the Paws version than the real thing! Seriously, I have reservations about Supreme Court proceedings being televised. I agree with those who are concerned that things could be taken out of context and as a result, be misunderstood. I'll continue to be satisfied with reading accounts of any court proceedings that interest me. Susan, I had read about this but hadn't actually seen the footage. I laughed until my sides hurt. I love them all--how could I choose??? Thanks for the great end to the week. 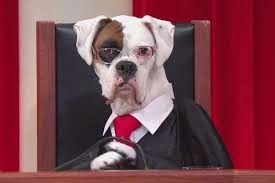 Of course, I like some of the judges much better as dogs! Hilarious! John Oliver can always make me laugh. My favorite justice was Kennedy, as we used to have German Short-Hair Pointers. They all were a hoot. Susan, how awesome that your husband was involved in this production. He must be very entertaining to have around.